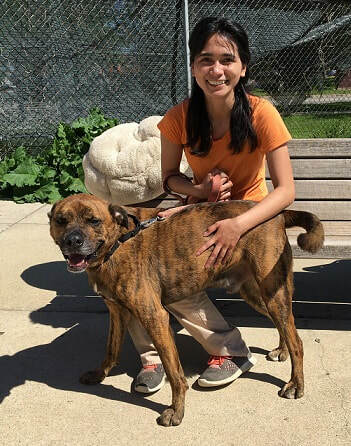 This semester, we funded a scholarship for a student (Sharon) who has volunteered for years with dogs at an animal shelter. In the past, we have funded scholarships for other students who volunteer or work at animal shelters &/or study to be veterinarians. Through this process, we are able to express our love for dogs while staying true to our mission: funding college scholarships. On rare occasions, we have given second scholarships to one of our Scholars. This semester, we gave out two 'repeat' scholarships. One for Anjelica, who attends college on the East Coast. One for Nim Yan, who studies at a university in the Midwest. Congrats to both! Beyond scholarships, we have tried to help our Scholars in other ways. In some cases, we have introduced them to people who can give them advice for their future careers. For example, we recently introduced one of our Scholars to CDW's Cara Dean (Senior Manager, Talent Acquisition). She put him through a mock interview & then gave him valuable feedback on it so he could get an understanding of what the interview process will be like after he graduates college. Thanks to Cara & others who help our Scholars!